Alright guys. Ive made a couple batches of pepper mash but this is my biggest batch and best attempt, using my best quality peppers. 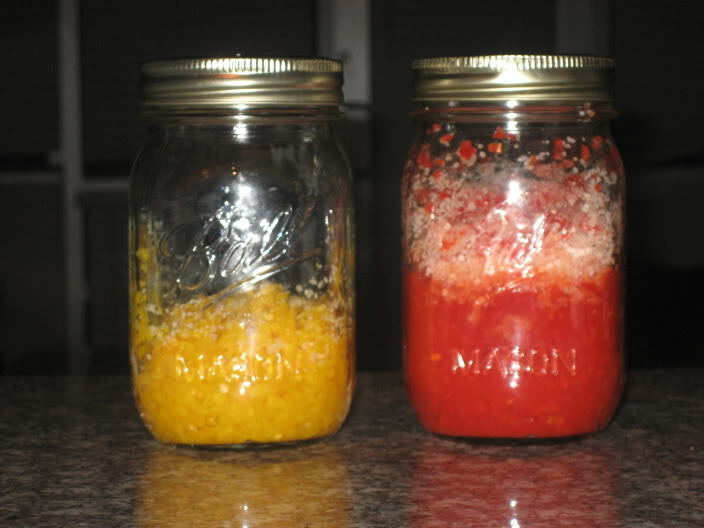 It's a very simple process that can yield you a fantastic base for hot sauce, or just to eat plain. Warning, this stuff is extremely spicy. 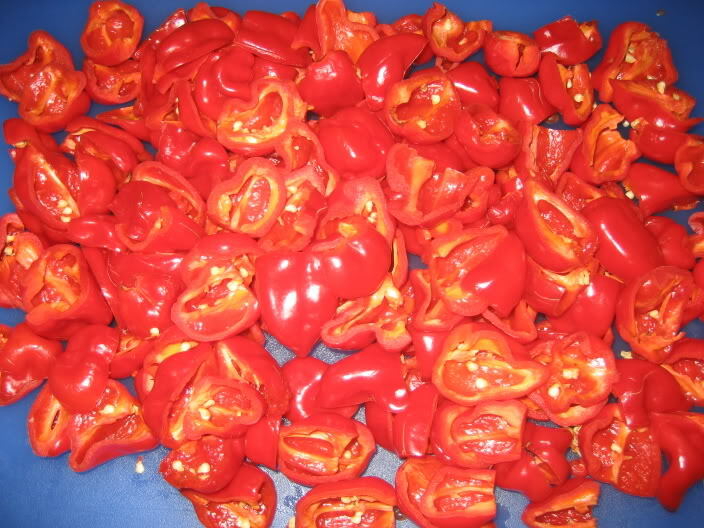 The key is letting peppers ferment like cheese or wine, they thrive on a lacto bacteria that turns them into a ripe goodness. You just make this up and let it sit for at least a month. Preferably six months or a year. Here goes. This is my first try at this step by step, so bear with me. Step 1. Get yourself a pair of latex or rubber gloves. rinse them well and make sure all that powder **** is off them. dont even THINK about doing this without gloves. 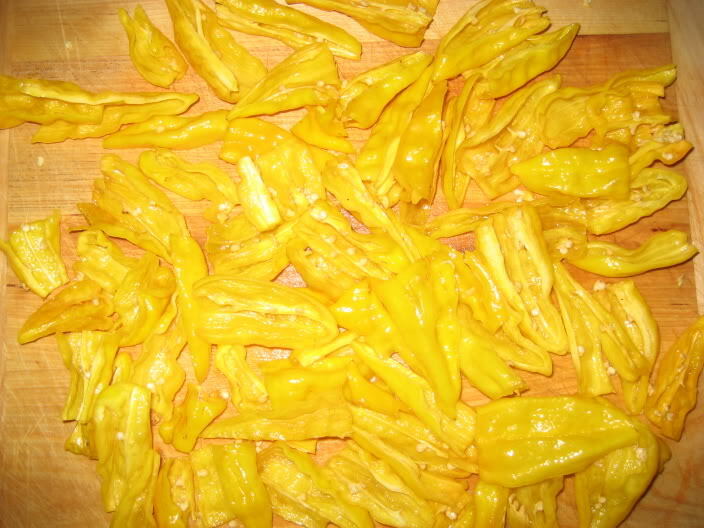 Take some delicious chinense peppers. I used red habaneros and Fatalii's. 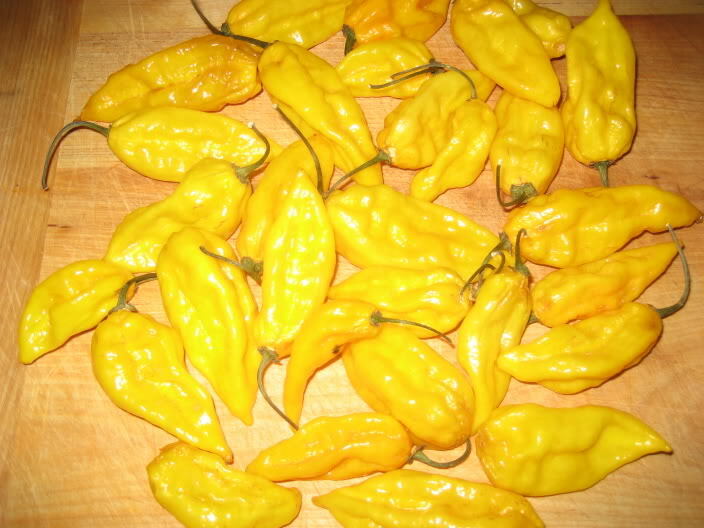 This recipe calls for about 2 dozen of each, though i used only about a dozen fatalii's. Dust them with kosher salt. First rinse these things as they are whole. You will be rinsing them again, but i like to get all the crap off i possibly can. Next, chop these things in half, lengthwise, and remove all the seeds and that pulp nasty middle section. this can be sloppy, just to do your best. Okay, now that you got em deseeded and cleaned up, Rinse them up one more time in a good mesh strainer. Now it's time to turn them over to the food processor. If you dont have one, a blender should do, or a very sharp knife. 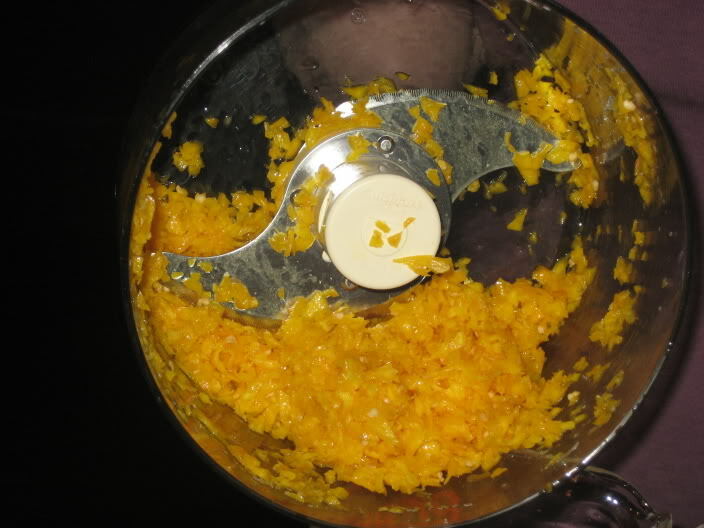 You want to blend them into very fine pieces, but not pureed or a paste. At this point, scrape the mixture into a 1 Pint Mason Jar, or any small jar with a tight sealing lid. The average measurement is 1 tablespoon of salt for 1 pint of diced/minced pepper. After the peppers are scraped in the jar, cover them with about 1 tablespoon of kosher salt, and give them a BRIEF shake. Finally, seal the jars up. apply the ring first if applicable, then the lid, and seal tight. Leave the majority of the salt on top. Okay. 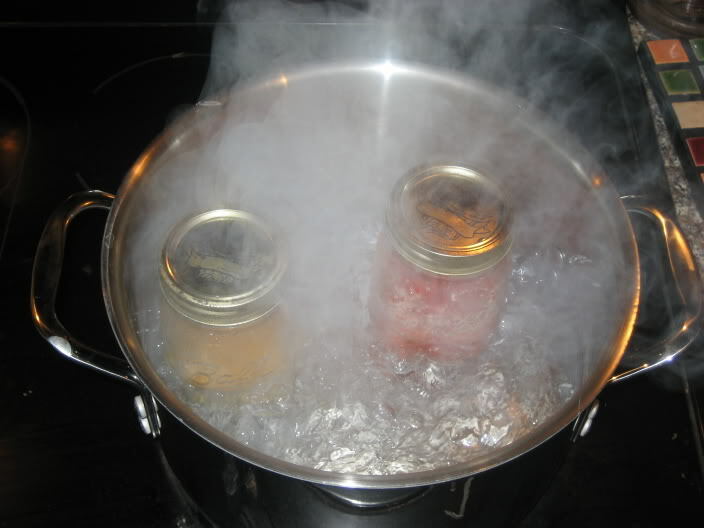 Get yourself a large pot, and fill it with enough water so it covers about halfway up the jars, and get it to a pretty heavy boil. like MED-HIGH. Okay. Let this boil for around 20 minutes. BAM! It is sterilized. Remove jars and let cool. Store these jars in a dark, cool cupboard. Let them sit AT LEAST 1 month. Most people say 6. Some people say a year is best. Tabasco let's theirs age for 3 years. 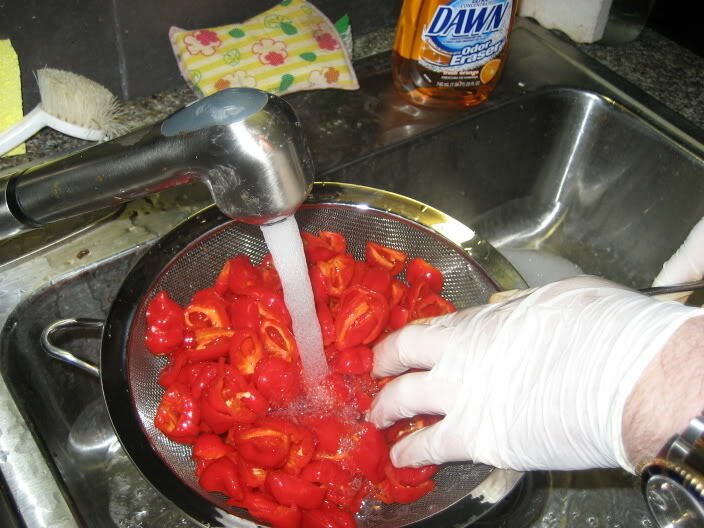 This will give you a FANTASTIC, deep, complex base for hotsauce. Add white wine vinegar to this, tequila, crushed cumin seed, salt, lime, roasted garlic, chipotle, whatever you desire. But do NOT add any of this stuff during the ferminting process. Wait until it's done. It should have turned to a liquidy mush, and smell cheesy and fermented. NOTE: This will only work with really hot chilis like habaneros and scotch bonnets, and i have heard cayennes. thai chilies and chili pequin and tepin should also be good. Do not use jalapenos or serranos for this. There you have it folks. That is how you make pepper mash. Good luck guys and i hope you enjoy it. 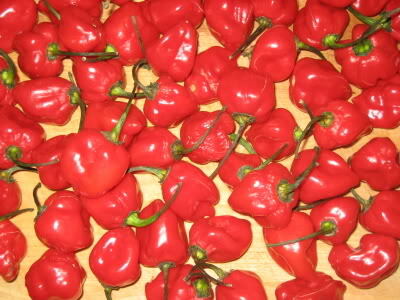 Very cool ... do you have a good hot sauce recipe using these that you are willing to share? We love hot wings and I'm tired of buying them when (I think) I can make them better and cheaper! Also, why can't you use jalapenos? Note to self...don't forget gloves, rub eyes, or use the bathroom! Looks like the fear man, good stuff! bringing this one back to the top. it was very short lived. Cool, thanks for bumping this back up, MLB! I missed it the first time. That's quite the interesting process you have going there, I may give it a go with the cayenne peppers I have coming in.